Numerous people have requested that I put together a sample that illustrates how to use SpecsFor.Mvc with Windows Authentication. Guess what’s in this post? Specifying your own ApplicationHost.config file for SpecsFor.Mvc to use is the secret to getting Windows Authentication to work. I’m going to assume you’ve already got your web project configured to use Windows Authentication. If not, that’s a can of worms for a different post (or perhaps Stack Overflow?) This post will focus just on configuring the spec project. First, let’s create our host file! 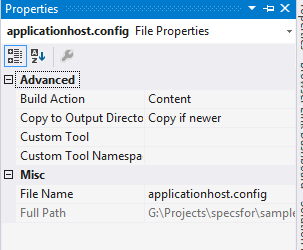 Add a new config file to your spec project called ApplicationHost.config. Modify the properties for this file so that it’s copied to the output directory. 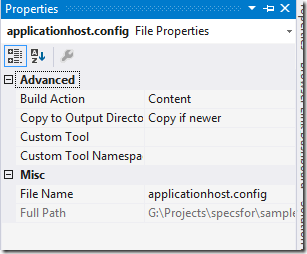 Now drop in the standard XML for an IIS Express application config file. If you don’t know what that is (I sure didn’t! ), you can use this file from the sample project. There are two changes you’ll need to make. First, find the <sites> element, and change the name of the only site in the file to match the name of the project you’re writing specs against. SpecsFor will overwrite this site definition at runtime. Again, be sure you set the path attribute to match the name of the project you are writing specs against! Now you can write a spec! In my sample, I had the view output the name of the current user, which should match the current Windows Identity at runtime. I’ve opened an issue for this on the Github project. I’ll get to it eventually, but if someone would like to submit a pull request…. The full source for this sample is available in the samples project on Github.